Kelly Olynyk in the Feb. 7 game against Pepperdine. 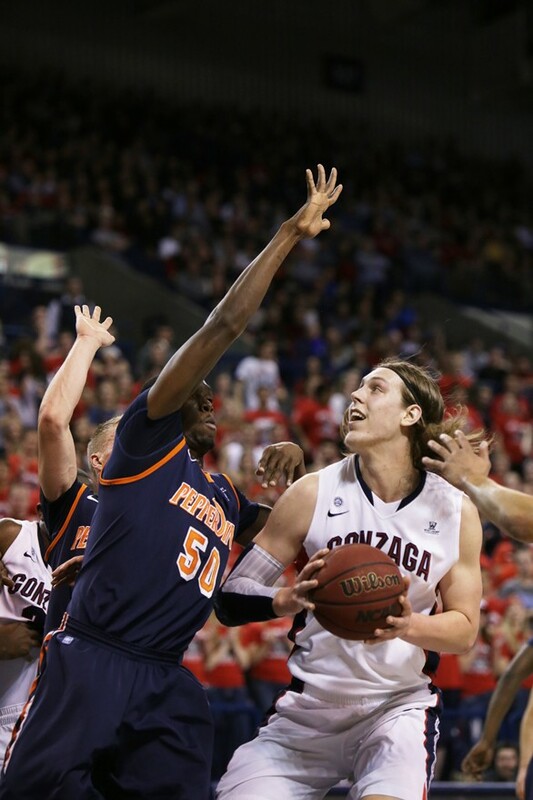 Whether or not you watch basketball, you've probably heard of Gonzaga's Kelly Olynyk. He's a 7-0 center who weights 238 pounds. Besides being freaking big (and having really long hair), he's also really good at basketball. The junior is averaging 17.7 points per game and grabbing seven rebounds. He is a projected first-round NBA draft pick, and he graduated with a degree in accounting in December. Here is a look back at his phenomenal success, both on and off the court this season so far. Old Spice all-tournament team: Although he didn't win MVP honors, Olynyk scored 14 points in the championship game win against Davidson. Graduated with a 3.53 GPA in accounting. Olynyk is currently enrolled in Gonzaga's MBA program. WCC Player of the Month: Olynyk averaged 18.1 points per game. Even more incredible, he shot 70.8 percent from the field. That's ridiculous. The Bulldogs went 6-1 over the month of December, due in large part to Olynyk. Jan. 7 WCC Player of the Week: Olynyk had an incredible week. He scored 21 points in a win at Oklahoma State (then ranked No. 10 in the nation), 16 against Pepperdine and 33 points in a win at Santa Clara. WCC Player of the Month: Wait, again? Yes. In fact, he did even better in January. He averaged 21.1 points and made 64.5 percent of his field goal attempts. Again, the Bulldogs only lost once, going 8-1. Feb. 18 WCC Player of the Week: Olynyk helped beat conference rival Saint Mary's by scoring 17 points and getting seven rebounds. Then, he scored 26 points and grabbed nine rebounds as Gonzaga snapped a three-game losing streak at the University of San Francisco. 2013 Capital One Academic All-America Division I Men's Basketball First Team: As mentioned above, Olynyk graduated in December with a 3.53 GPA. He joins four other male basketball players from across the nation on the first team. Olynyk is the first Gonzaga player to win the award since Dan Dickau did in 2002. Candidate for 2013 Naismith Men's College Player of the Year Award: This is the big one. The Naismith Award is considered one of the most prestigious college basketball awards. Olynyk is one of 30 players selected from across the nation. The winner will be announced on April 7. Candidate for the Oscar Robertson Player of the Year Award: Like the Naismith, this is a highly competitive national award. Olynyk is one of 12 players selected from around the country. The winner is announced on April 15. Former Bulldog Adam Morrison was a co-winner of the award in 2006. WCC All-Academic Teams: Today Olynyk, along with teammate Mike Hart, was named to the all-academic team.